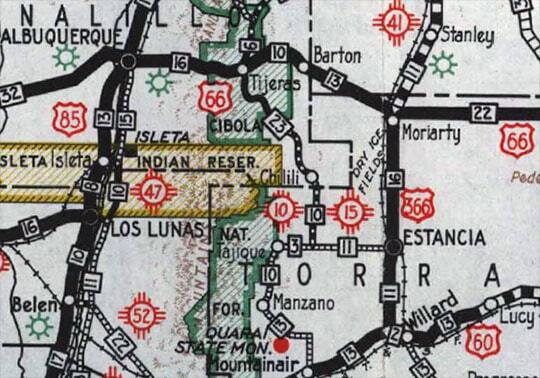 At the time those shots were taken, NM 41 actually had a "Y" intersection with US 60. Mainline US 60 is in the background, running just this side of (and parallel to) the elevated railroad bed. 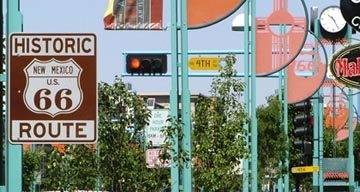 And it is likely that junction was also configured as a "Y" in the 1930s, back when it served as a US highway terminus. 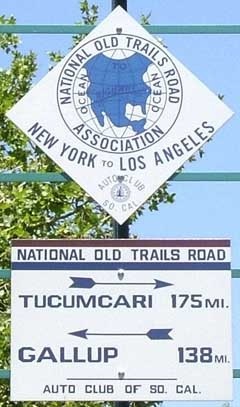 If so, then US 470-366 had two east ends: one to the left and one to the right. 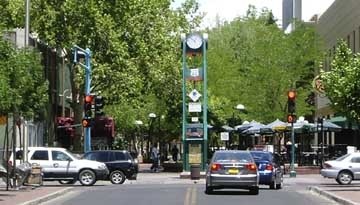 However, in about 2007, that junction was reconfigured to a more standard "T" intersection. 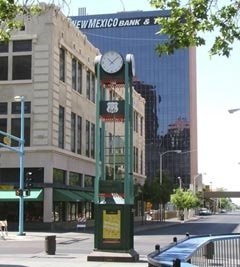 When US 66 was first commissioned in 1926, it ran north/south through Albuquerque along 4th Street (it was concurrent with US 85 from near Las Vegas NM all the way through Santa Fe and Albuquerque to Los Lunas). Originally, Central Avenue east of 4th was designated US 470, but it was renumbered to US 366 in 1932. 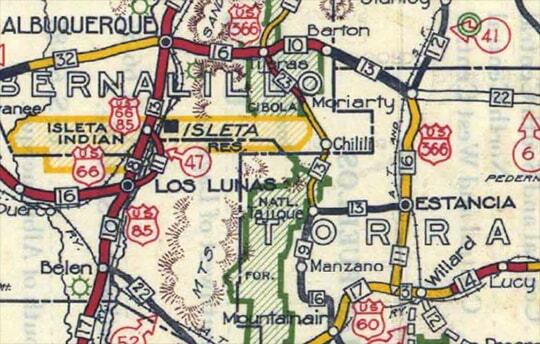 In 1937, US 66 was rerouted along a new alignment which bypassed Las Vegas, Santa Fe, and Los Lunas. In other words, it essentially followed the route of today's I-40. 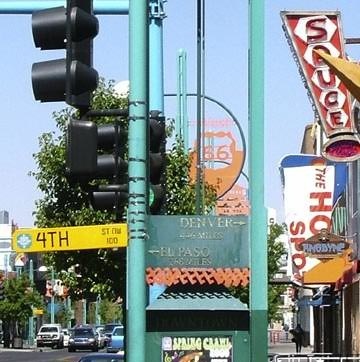 In Albuquerque, US 66 traffic was redirected to follow Central Av, thus running through the city in a direction perpendicular to its original route. 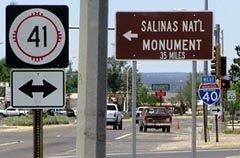 ​From that direction, the arrows point right (north) to Denver (446 miles) and left (south) to El Paso (268 miles). 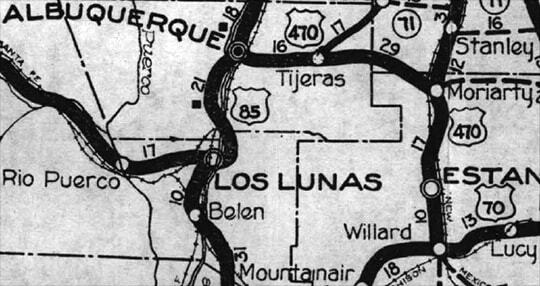 Those are points along "El Camino Real", which later became US 85, but of course that route is not nearly as well-known as US 66. 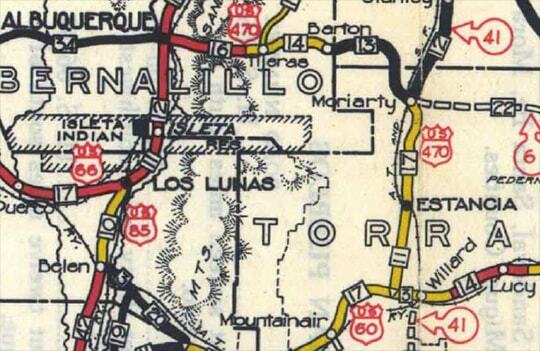 Originally, US 470 (and later US 366) turned left there to serve Albuquerque. But in 1937 that segment became part of US 66, so the trucks in the foreground were at what then became the north end of US 366. (The signage in the foreground was misleading: the quickest way to I-40 is to simply continue ahead to interchange 196. To the left and right is actually Business 40, but poor signage is nothing unusual in New Mexico.) That remaining segment of US 366 was presumably deemed too short to be a US route; it survived for only about one more year before it was completely decommissioned. last updated Oct. 16, 2016.